Once prized in the East Indies for its medicinal benefits, cardamom is now typically used as a spice to add flavor to foods. Each 2-tablespoon serving contains just 36 calories but imparts rich flavor -- a bonus when you're counting calories and want to avoid bland "diet" foods. To top it off, cardamom offers a number of nutritional benefits, including essential minerals and fiber, and cancer-fighting compounds. 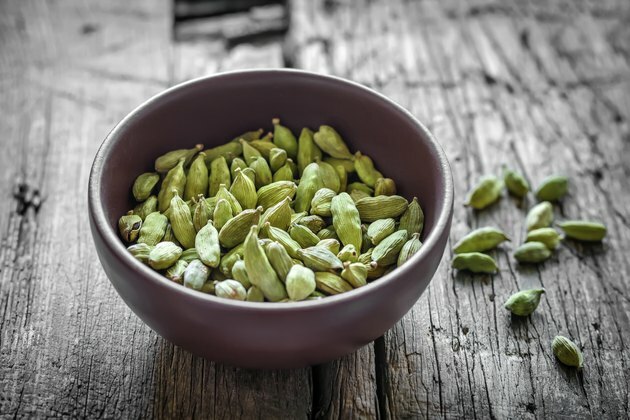 Cook with cardamom and you'll reap the health benefits of its fiber content. Your body relies on the fiber from your diet to keep you regular -- it softens and loosens your stools, so you're less likely to develop constipation. Fiber also aids in weight control by increasing your satisfaction after a meal and can help lower cholesterol. A 2-tablespoon serving of ground cardamom offers 3.2 grams of dietary fiber. This contributes 8 percent toward the daily fiber needs for men and 13 percent for women. Two tablespoons of cardamom contain 1.62 milligrams of iron and 3.25 milligrams of manganese. These minerals aid in cellular metabolism, so that your tissues can make the fuel they need to function. Manganese also plays a role in bone health, while iron helps provide your tissues with oxygen. A single serving of cardamom provides your entire daily manganese requirements, and also offers 9 and 20 percent of the daily iron needs for women and men, respectively. Including cardamom in your diet has other potential beneficial effects on your health. One test tube study, published in the "Asian Pacific Journal of Cancer Prevention" in 2013, found that cardamom contains cancer-fighting compounds with the potential to kill cancer cells as well as stunt new cancer cell growth. An additional study, from the September 2012 issue of the "British Journal of Nutrition," found that cardamom regulates gene activity in skin cancer cells and reduces the activity of genes linked to cancer growth. Take advantage of cardamom's warming aromatic properties to add flavor to vegetables. Light coat cauliflower in a mixture of extra-virgin olive oil and cardamom, then roast it in the oven until tender and slightly browned. Add cardamom to lentil stews and soups, or use a mixture of cardamom and lemon juice as a healthful flavoring for chicken. Alternatively, make your own chai tea mix by combining black or green tea with cardamom, anise, cinnamon and black peppercorns for a low-calorie and healthful beverage. What Are the Benefits of Pure Cocoa?